If you want to see Marco Rubio dance on hot coals, ask him about immigration. If you want to see Ted Cruz in denial about his record and past rhetoric, ask him about the same. The two presidential candidates went head to head on immigration in the latest Republican debate — two front-runner wannabes who see each other as the main impediment to the top of the pack. Clarity was not the winner in that exchange. Cruz asserted “I have never supported legalization,” despite having introduced legislation that would have extended legal status to millions who are in the country illegally. Rubio, when asked if he still supported a path to citizenship, uttered more than 400 words without answering the question. THE FACTS: That flies in the face of the Texas senator’s record and past rhetoric. Cruz has indeed been against an explicit path to citizenship for people in the country illegally, but he introduced legislation in 2013 that proposed eventual legal status for millions of them. Cruz defended that course on multiple occasions in the Senate and in interviews — usually stressing his objection to extending citizenship but also making clear he envisioned eventual work permits and other means of legal recognition short of citizenship. Cruz struggled Wednesday when pressed to reconcile his statements then and now. He told Fox News that he was actually interested in defeating the broad immigration bill at the time, even though he said in 2013 that he wanted an overhaul — without the citizenship provision — to pass, and that he wanted his amendment to prevail so people in the U.S. illegally could come “out of the shadows” and have legal status. The overarching effort to overhaul immigration policy that year failed. Rubio was one of the principal authors. Also notable from Cruz’s statement in the debate was that he subtly avoided closing the door to supporting legal status in the future. He said “I don’t intend” to do that, which doesn’t mean he won’t. The easy answer: Secure the border first. After that it gets tricky, unless you’re Donald Trump. 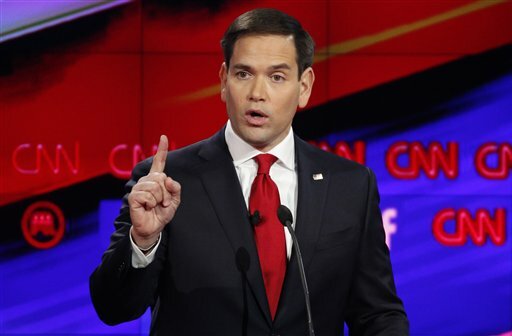 Rubio never said in the debate whether he still sees citizenship as an eventual possibility. But he did endorse legal status. After adding 20,000 border agents, finishing 700 miles of fencing, toughening verification systems and overhauling legal immigration, he’d let people who are in the country illegally pay a fine, undergo a background check and get a work permit for 10 years, if they haven’t broken any laws except immigration laws. Then they could apply for a green card, a step that assumes the possibility of eventual citizenship but may or may not mean that. Hispanic voters are important in the home states of the two senators and will be again in the general election. For the Republican primaries, though, the party’s traditional conservatives must be won over and motivated to vote, and activists even farther to the right must also be mollified and mobilized. These forces largely and often loudly oppose immigration leniency; indeed many are on board with Trump’s provocative calls for mass deportation and a bar on Muslim arrivals. Rubio largely retreated from the attempt to overhaul immigration policy after the package he helped to steer passed the Senate but stalled in the House. The initiative opened a rift with his tea party constituency and a concerted effort by him to mend fences — a period he recalled as “a real trial for me.” He’s more vulnerable on the issue than Cruz because he backed the path to citizenship, co-wrote the immigration bill and served as its lead proponent to conservatives.